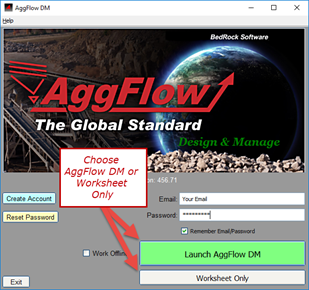 Step 1 – Launch AggFlow using the desktop Icon. Step 2 – Enter your username and password, use create account or reset password as needed. Option 1 – From the control panel, select “Create Project from AGZ File” – opens file search to select file to open. Option 2 – Drag and Drop – from File Explorer, select the file and drag it to the control panel, it will create the file in the company that is highlighted. Option 3 – Drag an entire folder of AGZ files into a company, it will build the same file structure and import all the AggFlow files into the company. Option 3 – On the Open Worksheet, select the File dropdown menu and select Open Revision to browse for and select the file to open.